Enhanced reporting capabilities – We have updated our reporting systems with new report formats and the flexibility to quickly generate new and more informative reports supporting forage and feed diagnostics. Dream it, do it! If there is a report or data analysis approach that you would like to see, we may have already put it in place. If not, share your idea with us. With our enhanced data management system we have the flexibility to meet your needs! Our new reporting service offers a number of distinct features of the competition. Review some of our sample reports below in Adobe PDF. Please review Understanding Your CVAS Forage Report for information on each of the reported values. 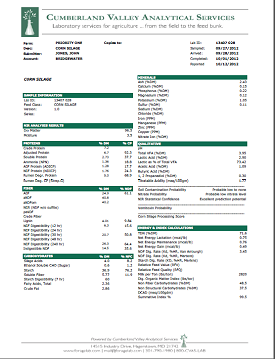 Sample Farm Report "Key Nutrient Report"